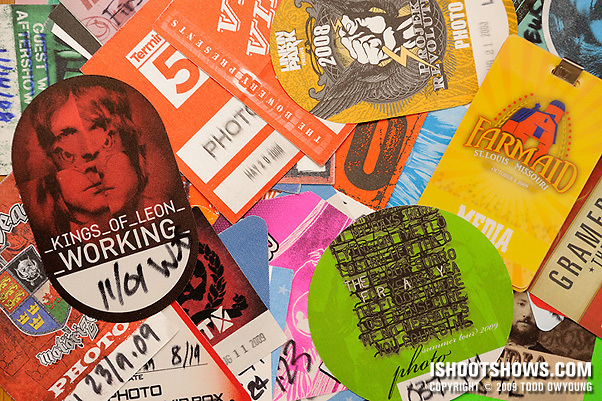 Requesting a photo pass is a simple task, and one thing every music photographer should know how to do. And lucky for you, there are really only three things a publicist or manager wants to know when making the decision. Under most circumstances, the photo pass is a credential that is intended for photographers providing editorial coverage of a concert. For more info on the photo pass, please see that intro article here. If the publication you're shooting for has an assignments editor, you probably don't have to make requests for credentials yourself. For everyone else, this article is for you. Personally, I prefer to make requests myself even when I do have an editor, as it's simply a more direct line of communication. What concert do you want to photograph? Almost without exception, who or what you're shooting for is the single most important factor in whether or not you will get a photo pass. Publicists want to know who you're shooting for because this allows them to easily gauge the worth of the coverage and the images that result. When making a request, include all the necessary event info so the person setting up credentials knows exactly which event you'd like to cover. Your name is probably the least important piece of information out of the three, though of course they'll need it to put you down for the correct credentials. The above pieces of information are really the only things a publicists wants to know in most cases. If more info is needed, you'll be asked for it. This article could easily be titled, “Assignments: The Secret to Getting Photo Passes.” If you're on assignment for a relevant publication, getting photo passes should be a piece of cake. If your publication is small or you haven't worked with a particular publicist or label before, a short introduction about your media outlet might be in order, but it's not necessary. Be Polite: I have only one other suggestion about photo passes, and that's to be polite. You are not entitled to receive a photo pass and publicists are busy people. Politeness and general courtesy can go a long, long way in building relationships with the media gatekeepers. But I'm not shooting for a publication! If you're not shooting for a publication or other use that will do meaningful work for a publicist, there is no reason for them to arrange credentials for you. I know; it's a hard-knock life. This isn't to say that it's not possible to get passes for shows when you're not on assignment, but simply that giving out passes in such cases doesn't really help publicize bands in a meaningful and reliable way in most instances. I know there are a lot of people out there who are probably interested in this last bit about what to do when you are not shooting for a publication, but that's a separate article. In the meantime, please feel free to discuss the merits of what you think publicists need to know and how you approach the act of requesting a photo pass. Great article as usual Todd – just going through this fun process with the John Mayer gig here in Sydney on Thursday night. Thanks for the comment, nice to hear from you here. Good luck with John Mayer this week. I shot him last year and he puts on a good show. Watch out for when he comes to the front of the stage, those were some of my favorite images from the performance I covered. I’ve ha more luck with bands and venues. As far as publications go, use a social media site like Twitter to promote your work. Follow blog /review/ article writers at the publication. You’ll get good at finding the gatekeepers on Twitter. Befriend them, show them your stuff. Offer shooting the first show pro bono. Passes should be easy if you atleast have a portfolio to show them your a real photog and not a show squatter. Good luck and get your name out there! Use every option available! What a great article Todd! This is a big help for me, since I’m starting to go full time with my photography now. A question I have though… Is how do you get in touch with the publicists? Also, being a freelance shooter, how do you get hired from a publication? Or what are some of the steps you take to get notice by a magazine, newspaper comp, or etc… Thanks for your time, Todd! Looking forward for more pics on flickr! Those who want to shoot for portfolio reasons, don’t give up hope! I have run into photographers at shows who were just shooting for their portfolio. Maybe it comes down to whether the publicists have any spots to spare for that particular show? Not sure. Also, I think linking the publicist to your shoots you ended up taking helps build a relationship as well. I, too, like to arrange my own passes. I think it’s important having a direct relationship with the publicist, especially if you shoot for more than one publication. Another tip if your publication is small or you haven’t worked with a particular publicist or label before: Include a link to your previous coverage of the band, and if you haven’t shot the band before, a link to your coverage of another act represented by the publicist. I find this particularly helpful with larger national acts. I have a question that might be somewhat related. I received a photo pass to shoot a Miranda Lambert concert in Chicago October 3rd from Miranda’s mom since she liked my work in the past. Miranda’s mom actually gave one of my photos of Miranda and Blake Shelton to them as a Christmas present and its hanging in their house (had to mention that, pretty proud of it) anyway i had to sign an agreement with the publicist stating that i cannot use or post any of my images until they are approved by them. I edited everything really well and did not include any unflattering shots, sent them a link to view them full screen ect. Miranda’s mom loved them and said she didn’t see any reason i could not do what i wanted to do with them. So thinking i was free and clear i posted a few on my site with a good detailed review of the show and a link to view the rest. I also have a shot in coming up in the November issue of Best in Texas magazine. Almost three weeks later the publicist sends me an email stating none of the shots were not approved by her manager. So because of that agreement i had to remove them all from the web and i can’t even use them in my portfolio. So basically i just have to sit on them and can’t show them to anyone. Long story i know but have you been in that situation? anything that can be done to allow use of some shots just for myself? Love to get some feedback on this from anyone who has been in this situation. Thanks. A little tip after recieving credentials is to make sure you get a contact name/number for someone who will be there on the night if there are any issues. I’ve arranged credentials with a record label for a band here in the Uk and then turned up on the night to be refused entry because no-one’s heard of me, or know I’m coming. Only 1 guy knew the PR person at the label who arranged it too. I was subsequently refused entry by the band’s management. Have never made that mistake again. Been there, done that. That SUCKED so badly, but luckily I never leave home without a compact P&S. I’m currently carrying a Leica V-Lux 30. Could not get the 7D in, but they didn’t care about cameras that don’t have removable lenses. Bob, when you go on a shoot, is it for a publication or for your blog normally ? Great article. One bit of advice that is really important once the pass is secured is make sure you bring the band or venue’s contact information with you. I had a situation while shooting Roger Clyne & The Peacemakers on 10/30/09 (photos: http://xrl.us/bexwow ) that the manager accidentally left my name off the list. I called her and within 5 minutes everything was in proper order. WIthout the info I would have been either SOL or scrambling around to talk to other people. Thanks for all your insight and willingness to share your knowledge. Nice article Todd. I can’t wait for the second part as that fits my scenario better as I’m just starting out and have a few bands that I would like to get passes for that are playing smaller venues in my city. JR, thanks for sharing your experience. Nothing comes easy! But I guess that makes success all that much more enjoyable. todd, this is awesome. thank you so much! i can’t wait for the one on not shooting for a publication… but seriously, this is so unbelievably helpful. so thank you again. From my experience, and I have only been doing this for exactly 12 months – if you are shooting for your own portfolio, make sure you have a professional website to back you up. It has helped me out tremendously. I am pretty upfront with bands and promoters. I let them know where I’ll be using the photos and I grant them use to some of the images for their respective websites. And as Todd stated, be as courteous and professional as you can be. So far getting the photo passes have been the easy part. It’s trying to locate the publicist from whom to request the pass that’s been the biggest challenge… Any tips on that? Going through the promoter is semi effective, but that’s just one more person between you and the pass, and you never know when or how THEY are going to approach the publicist. Todd, great article, the information really helped cannot wait for the second part on trying to obtain a photo pass if you are not with a publication. I really want to shoot some bands, I have shot some bands, like Fall Out Boy and Butch Walker but that was done with a friends pass. I think my pictures are pretty good and have posted them on my website, facebook, buzznet, flickr but I really do not know where to go from there, I am afraid email a publicist, I don’t want to get shot down..should I take a chance, any suggestions? Speaking from the point of view of the publication, and the person who puts in the access requests, I have asked all my shooters not to put in requests to publicists stating that they are shoot for me. The problem is that unless I know that they have already put in a request, the publicist will get 2 access requests from my publication, and you really don’t want to upset these guys. I can fully understand Todd dealing with the requests himself. He is in a special position where his images are desired by numerous publications, and the publicists are aware of this. It’s much like writers syndicating their interviews. I have a number of writers who source their own interviews and then offer them to many publications, us being one of them. The same can work for photogs. The question of how to get the publicist’s contact details has been raised. In Australia, the promoter of the tour is a good start. Just looking at the promoter’s websites will tell you who is looking after what tour. You also find that there is usually one person within that promoter that will look after access for all tours, so once you know who this is, you are set. The question is, how do you find this person? If I am ever unsure, I simply call the promoter. Their number is easy to find, check their website, phone book. You simply ask “Just looking for the contact details for the person looking after access requests for Tori Amos’ Sydney gig”. What you need to be ready for is being asked who you are. If you are not shooting for the media, don’t lie. Tell them that you are a freelance photographer who would like to put in an access request for the gig. Fingers crossed, you’ll get an email address, and off you go. On another note, whether or not you get approved depends on alot of things. Management may have requested that only the dailys get the spots, or the publicist may only give access to publications that have run lead up interviews. Also, the number of spots available is a big thing, and from what I can determine, it is decided by the band’s management rather than promoter/publicists. If management comes back with 12 photog spots, and there have been 8 requests from media, there is a good chance that freelances will fill the rest. On the other hand, if there has been 20 media requests for those 12 spots, even media will miss out. Great article – Thanks for sharing your insight. I have had the most luck contacting the artist’s publicist. Venues are iffy at best and managers can be flaky but the publicist wants/needs publicity and they are usually the most accommodating. Once valuable point is that if/when you do get approved for a photo pass prepare for the unexpected. I regularly get photo passes from a band and I showed up one night and my name wasn’t on the credential list. But since I had the band mgr’s (my contact for the credential) phone number and everything was resolved with a phone call. Long story short: Bring the venue or band’s contact information no matter what – It will save the day eventually. Todd, your website is awesome. A big “Thank You” goes out to you and all the posters for the invaluable advice and knowledge. Hi Todd, I’ve managed to get to the point where I am having a good hit rate with requests for a photopass. Just wondering from your experience when is the best time to make the requests? When the tour is announced, sometime between then and the gig or only a few weeks/days before? I know that there won’t be an answer that fits all so what are your guidelines for when which approach works best? I guess im the odd ball on this topic lol. I dont shoot for a publication, I get approved to shoot national acts, ive never been turned down for a pass (ive actually turned one down because of rights grabs) And other than that i have never had to deal with any contracts. My biggest problem is actually getting paid for pictures or finding the contact info for passes. Sure ive had a few pics of local bands in local zines but thats it. Still trying to update my equipment/learn more about mine. I currently use a nikon d90 and a 24-70mm 2.8 lens. -When booking a band for promo shoots, do i have to pay them? If so, how much does it usually cost? If not, what do i need/have to book a band for a photo shoot? Big fan of your work, Todd. Big ups!! You should not have to pay the band to make portraits of them – if anything, they should pay you. Oh, ok. I just thought of it ‘coz you’re taking some of their time. If they were to pay, do the manager/band ask how much it would cost them? If they do ask this, what should I say? I mean, for a beginner in concert and band photos, how much would I charge them? If I were to ask, I would actually do it for free, especially if I know and like the band and their music. Nice job !!! Your site is on my fauvorite ! Could you send for us a example of a email requesting a photo pass ? It’s reasonable to email editors, but be more general in your approach. Publications are generally not looking for one-off photographers; they’re more likely to have a group of go-to photographers that they use. I have only recently started “taking the next step” with concert photography (I’ve had about 10 photo passes in total, so… baby steps) and I just wanted to take this opportunity to thank you! I admire your work and you’re such a great source of inspiration and your tutorials and guides have helped me so much, both in becoming a better photographer but also in terms of how to approach things. I’ve learned so much by reading your tutorials and I’m so thankful that you take the time to write those. Really so glad to hear that the info I’ve put forth here has helped you, thanks for sharing your story. Cheers. hey todd, love the site. i was just wondering what the best way to format a request for a photopass, like how do i word the email. that has always been my biggest challange is how to write the request. My advice is just to use common sense and to be polite. As I state, the main thing is who you are shooting for, and the date. If the reason checks out, they’ll set you up. Hopefully you can shed some light on this for me. I am wonder what is the minimum publication size that will get you “approved status” for a photo pass. In other words, how many visitors/unique visitors do publicists consider worthy before they issue a photo pass. Thanks for the help, love your website! The answers depend on the size of the band and their requirements – and questions only the publicists can really answer! I just had a publicist tell me they could get me a photo pass but couldn’t get me a ticket as they had a limit due to the fact they were a small festival. Do you find it’s much easier to get a photo pass when you’re paying your way in as opposed to requesting guestlist as well? Or is obtaining photo passes equally competitive, and therefore you should hop to it when you find out a show is coming to your town? If it’s a festival the photopass will normally give you access throughout the day/weekend if there are loads of bands playing. You just will have whatever restrictions they place on you for each artist/stage. Here’s an issue I’m still trying to sort out: When is the appropriate time to put in media requests? I’ve been contacting publicists about 2 weeks before the scheduled show. Would you say that’s about the right time frame? Anyone have one example ? I keep coming back to this, since getting my first pass, I’ve had a hard job getting any more. Have now worked out a deal with a friend who runs a zine, basically, I can just use that as my publication (and of course I won’t lie, but it does mean I will probably need to write reviews as well as shoot). An idea for a future article, which I would be very interested in, would be what comes next? you got yourself a pass, as advised by your site, you went and thanks to the awesome advice here, you come back with some stunning shots, what next? I mean, the experience itself is fantastic, and I’ll happily do it just for that, but how do you make it pay? how can you make use of the shots you got? There seem to be some obvious options (selling prints, etc) but how could you approach a magazine AFTER the fact? or other avenues for making it pay? Hey .. wondering the same thing. I know this comment is way old, but I just discovered this site. Any advice on this topic? Have you had luck? I’m in the extreme beginner phase… as in, just learning and going to go out on a limb for a photo pass to build a portfolio LOL Any advice? Hey Todd, I was wondering if you do get lucky and get a photo pass without working for a publication, do you also get tickets to the show, along with the pass? It all depends on what you ask for. I am also very new to concert photography but have not had any luck with promoters,record labels,etc. Instead I have approached the directors and/or the appropriate staff at the actual venue well ahead of time. Told them that I had an assignment to shoot the show and what was the procedure at their venue. So far I’ve only shot 4 shows but 2, Willie Nelson and Guy Clark, ended up not needing a pass at all. The other 2 that did require a pass, Shelby Lynne and the Beale Street Music Festival, were granted after an editor that I have established a relationship with send an official request to the venue director and they forwarded it up the chain for me. I have a photo pass for a show in a little over a week and i was wondering if you had any tips in regards to like arrival time, where to pick the pass up, and what to do between performers, like during sound checks and such! @Lindsay It’s not normal for a regular photo pass to include the sound check. So find out what time the first band is scheduled to come on stage and arrive around 30 minutes before (plus as much time as you need to leave to check your gear is in good order and set-up the way you want it). In my experience most passes are handed out at the “guest list” window of the box office. If no special window, ask at the ticket collection window for the box office. Between acts I generally review the photos I took, edit out those that you wouldn’t want to keep and have a look at what settings were needed for the light (remember though that the support bands are often not given the same lighting as the main band). Wow…a lot of great information..thanks. what if i’m from another country ? Is it possible to score a photo pass by contacting the opening bands press people? It is, but the danger you run is that you are only authorised to shoot the support band. Hey Todd can I just say how inspiring and helpful your website was last year when I was starting out. So far have gained passes for 5 festivals and 5 gigs ranging from bars to arenas. Most of my passes so far have been obtained without a publication so it is possible (although harder) without one. I think (certainly in the UK) the most important thing is knowing lots of people in bands and the industry (not easy if you’re as shy as me!) My first pass came when a memeber of my favourite band sent me a message on facebook saying he loved my (p+s photos from the crowd) and did I want a photo pass (to a 3,000 capacity gig)! The other passes have come from either being a friend of a friend of the band/management or from emailing fesival media/press people with a link to my website. I’m excited about the future and hope I can move up to the next level in photography and shoot even more! Hi Todd, first of all I have to say your work is awe inspiring but I’m sure you are aware of that already….The hardest thing i find about getting passes is actually finding the relevant publicist or press agent responsible for the tour or show you are requesting to cover….I get the passes myself but work for a website whick gives me the necessary creditation but I do struggle at times…any advice on this? I really enjoy this site, keep it up! Hey Todd. I’m a music photographer from Staten Island, New York. I’ve been hearing a lot of different opinions from my friends about, “How soon is to soon to e-mail a press contact for a photo pass?” Is it ever to early to e-mail for a photo pass? I usually start sending out e-mails with 2-3 weeks notice. im shooting an event for my first time and they sent me an app and i need help with 2 questions…. i have no clue please help me out ! Outlet is the publication you’re shooting for. That is required for most photo passes — press passes are only intended for media and press that are going to help a band’s publicity and image. Reach is the circulation of a print publication or the monthly views/impressions of an online publication. They want to know how big of an impact your images will have. All things being equal, a publicist will give preference to a big publication over a small blog, if guest spots and passes are limited. If we are just starting out and not shooting for a publication how would we go about obtaining a pass? Would it just be out of luck that they would give us one. Yes, I think that if you’re not shooting for a publication, it comes down to luck, a publicist who is willing to take a chance, or a band who just isn’t strict with photography. A photo pass functions for the benefit of a band, not photographers. The pass is generally held at the box office here in the US. You may need a ticket as well as the photo pass, depending on the venue. For large venues, you might be escorted by a media handler, but for club shows, you can usually just go in. If the tour/venue has a photo pit, you’ll be able to get access with your photo pass. When in doubt, you can ask security, they should be briefed on what photographers can and can’t do. The people at the box office who give you the pass might tell you the rules and know if there’s a photo pit or not. Be nice to security. Hope this helps.